The family had outgrown their life in a condo in pricey downtown San Francisco. 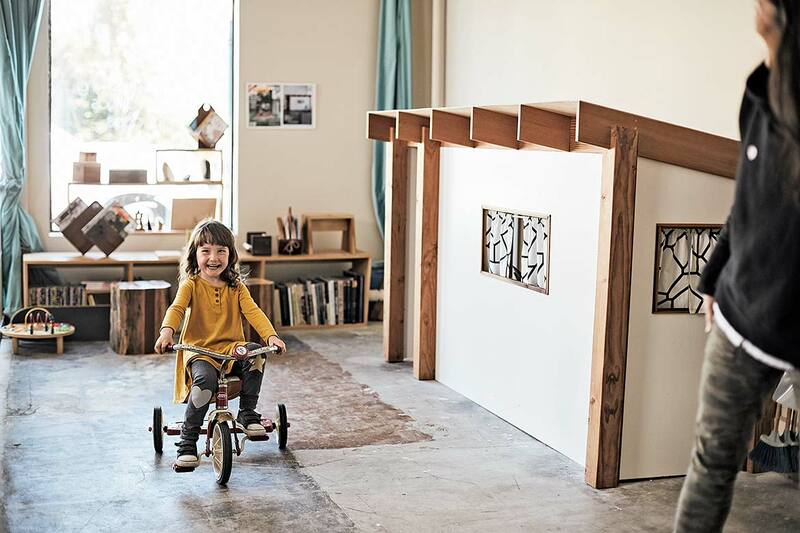 At 500 square feet, it was adequate in size but too far from Danny Montoya’s business, a woodworking workshop for children called The Butterfly Joint. A butterfly joint is a carpenter’s term for the bow-tie-shaped piece of wood that is used to splice a split in a larger board. And that’s exactly what Montoya and Erin Feher wanted to do: to marry their two spaces—home and work—into one family-friendly life. At the time, Feher, now 38, had been editing Habitat, the San Francisco Chronicle’s design magazine, and was five months pregnant with her second child, Vega, when San Francisco Magazine approached her to become its design editor. “I didn’t think I wanted a full-time job. But I’ve always loved the magazine,” she says. She ended up taking it, which made Montoya, 41, the primary childcare provider for Orion, 5, and Vega, now almost 2. It was a DIY from the get-go. When the couple met, Montoya was working as a kindergarten and first grade teacher and moonlighting as a DJ, but he later segued into commissioned woodworking. When he set up the woodshop for kids, he had a ready-made clientele from his 15 years as a beloved teacher. He also had the skills needed to reconfigure their new place. He set about remaking it with the help of Feher’s father, a retired contractor. They all slept on mattresses in the shop downstairs for a month while they built out the upstairs. ”And then, my dad left, and we had this empty house,” says Feher. 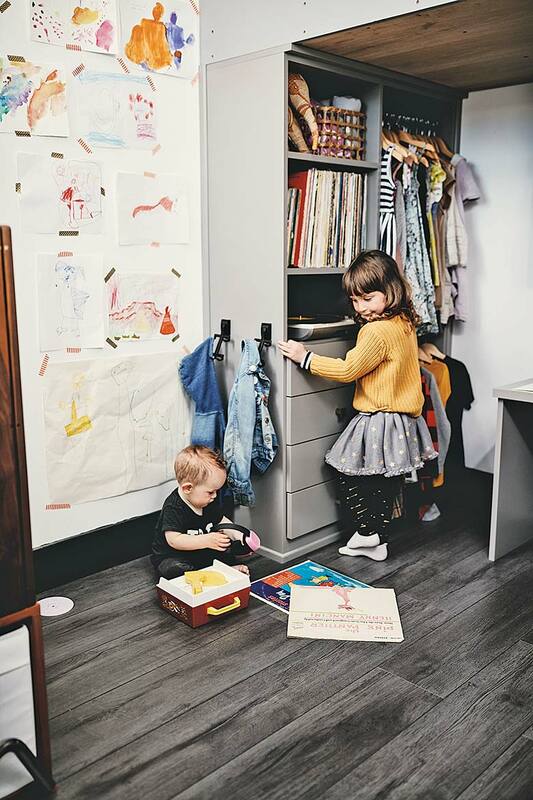 In the 7-by-11-foot children’s room, Orion loves hanging up her dresses, while Vega, almost 2, plays nearby. In The Butterfly Joint downstairs, Orion works alongside a dozen other children enrolled in the class while Montoya keeps an eye on the baby sleeping upstairs via video monitor. Feher leaves work promptly at five PM. She thought they might have to get a car, but instead she got an electric bike with room for three children, like the ones they had seen parents using in Amsterdam when they were child-free. Like many older millennials or echo boomers, Feher and Montoya had children later in the life, and the second child changed their lives significantly. They no longer travel to Europe annually or go out as often at night—but they were ready for the new lifestyle. They entertain at home or, after the kids are in bed at 8, stream HBO on a laptop. “Your life changes,” says Feher. “We do so many more close-to-home things. We go camping. We really enjoy parenting and really enjoy our kids. We want to make them a full part of our life.” The butterfly joint worked tenfold, marrying both their work and family into a strengthened whole. 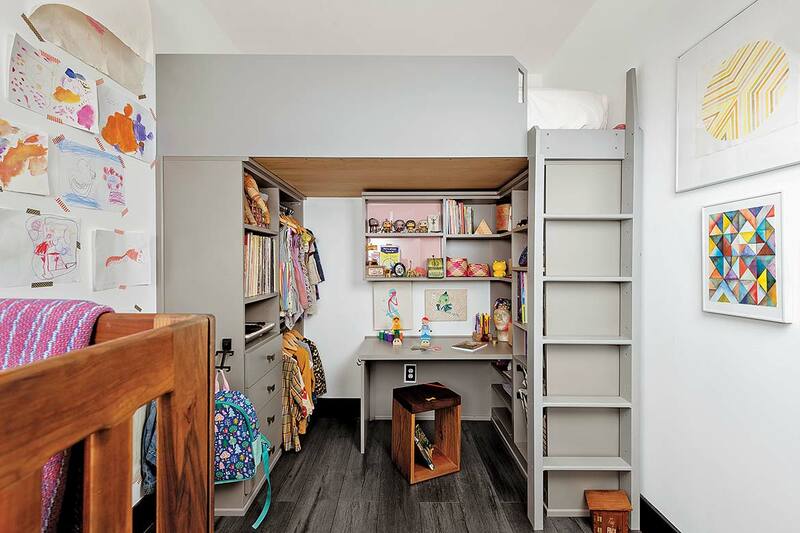 The Butterfly Joint serves as an extension of the household, a place to entertain friends, and an after-hours playroom, which Orion, 5, takes to her advantage.